It’s giveaway time! And it’s also time for the Thrifty Style Team to share something thrifty. And what can be more thrifty than FREE! This month the members of the Thrifty Style Team decided to have a giveaway, sharing a gently used thrifty or handmade item with our readers. I’m hosting a pinecone flower giveaway, but you will have a chance to enter all eleven giveaways. You remember my pinecone flowers, don’t you? Well, I’m getting quite a reputation in the blogging world for my pinecone projects. Yep, that’s me-the pinecone lady! We just happen to have a large pine tree in our yard that drops a bazillion cones. That tree probably knows that I can’t bear to throw those gifts from nature away. So I collect them in a big container until I dream up another use for them . So I thought I’d share some of those cones with you by having a pinecone flower giveaway! I’ll randomly select one winner to win some pinecone flowers painted in the color of your choice. These pinecone flowers look just like zinnias and look very pretty displayed in a bowl. Those same flowers made a reappearance that fall on this rake wreath. There is so much that you can do with a pinecone flower. A simple, simple project is to just hot-glue them onto skewers and stick them in a vase for an everlasting arrangement. For more ideas, just do a search on Pinterest. The most interesting one I’ve seen lately is where the pinecone flowers were painted various shades of the same color. I’m sure you’ll find a wonderful use for them. To enter the giveaway, just leave a comment on this post. For an additional entry, become a subscriber to our blog or let me know if you are one already. The winner must live in the continental US and the giveaway will remain open until Wednesday, March 21. Update: This giveaway has now closed and the winner has been contacted by email. Don’t forget that you can enter the Thrifty Style Team’s Grand Home Decor Giveaway on any of the blogs below. Just click on the links below and good luck! I have been collecting pinecones since winter began this year. I walk my dog at the local park where there are an abundance of pine trees. 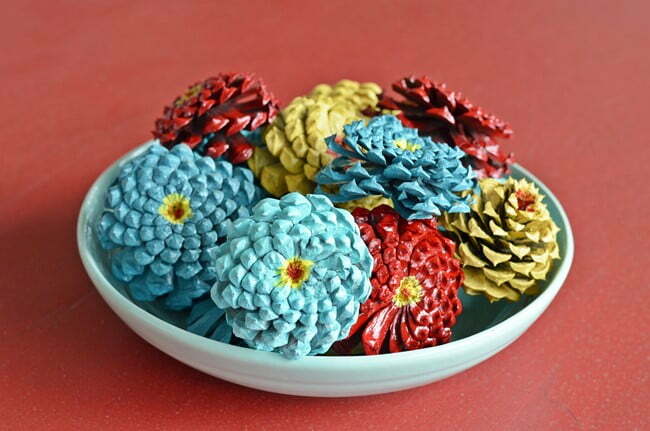 Never thought of making flowers from pine cones. How clever! Love your colors used. Many nice ideas. I would love to win your painted pinecones. Thank you for the chance! What a brillant idea. Pinecone flowers. I saw it hear first. Omgosh your pinecone flowers are so beautiful ! 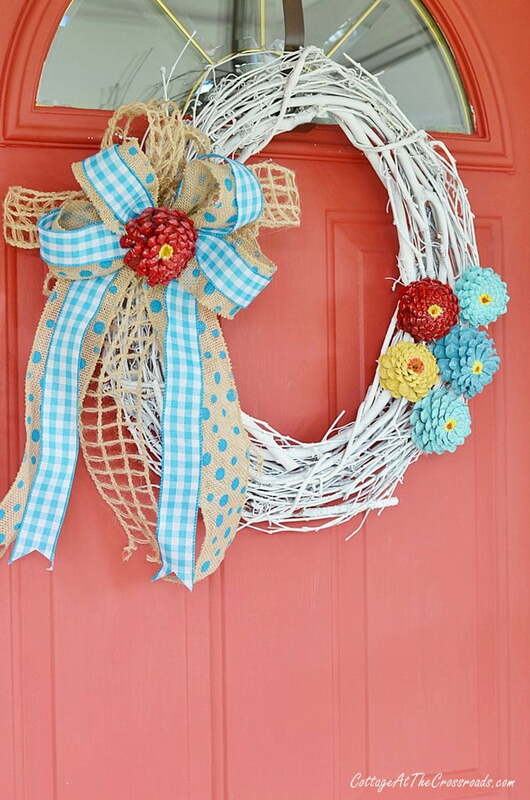 I love the different wreaths you’ve made with them! I would imagine so many uses for them also ! Thanks for the chance to win them! I’m so glad to have run across your site in the giveaway! A new subscriber following of your sites on social media ! I LOVE your pinecones!! I have subscribed to your newsletter, as I love your style. Thank you for the opportunity to possible receive your Zinnias! I’m a new follower! These are so pretty and unique! Would never have imagined it! So cute and I’m very ready for spring!! I have always wanted to make these. They’re beautiful. Zinnias are my favorite summer flower. I’ve been wanting to try to make pinecone flowers. It’s such a clever idea! I wouldn’t love to win the painted pinecones. 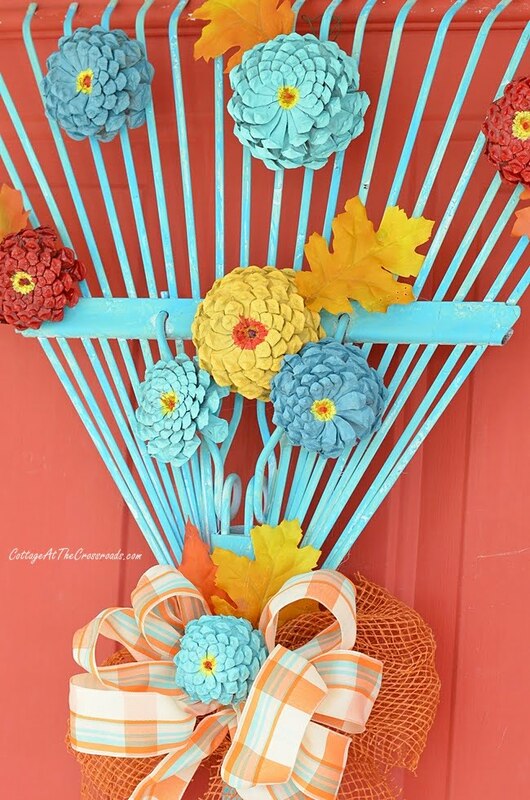 I saved an old rake to make a door decoration and these would be perfect for it! Love these little gems. And I just became a subscriber. These would look awesome in a arrangement with Tillandsia. I’m a subscriber – always like seeing your new decorating ideas. I love your pine cone flowers! So pretty. Jane, you have so many lovely projects in your home. Your Zinnia pine cones are definitely one of my faves. Really colorful and unique. I always enjoy visiting your blog for inspiration and creativity. Tell Leo, Hello” for me. These pinecone flowers are amazing — I never would have thought of doing this myself! I absolutely love them, and all of the pretty spring colors. I would love to make a wreath like the one you’ve displayed. You did a gorgeous job painting these, and I love how you showed how to use them in decor! 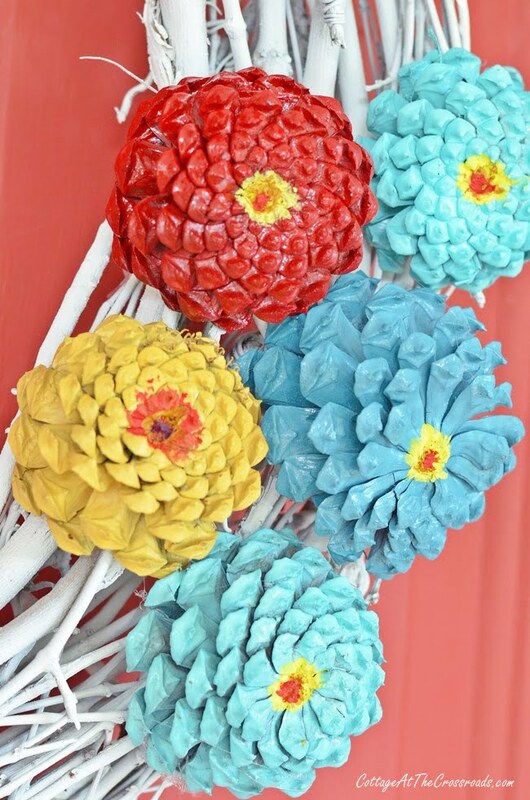 OMG, I love these pine cone flowers & am SO IN Love w/ the colors you have on yours! Thank you for this giveaway & GOOD LUCK Y’ALL!! These pine cone flowers are absolutely stunning. Such creativity! I’m a new subscriber. Thanks for the giveaway! Love the wreath with the pinecone flowers. Oh, my, what pretty pine cone zinnia flowers. I love zinnia’s just as much as the butterflies do. Enjoy your blog and thank you so much for sharing your very great projects. any that you wish to share. Zinnias are one of my most favorite flowers! These pinecone ones are so clever. I would love to display them on my kitchen counter. And I am excited to now be following your blog! Oh Jane, what a lovely give-away. I have admired your pine-cone flowers since i first laid eyes on them. I have shared your tutorial about making them with friends in hopes that someone would make some and share them with me! No such luck though. And how could I not subscribe to your delightful blog! I so look forward to your emails so I can see what you and Leo have been up to! Love the pinecone flowers. I’m a subscriber. Thank you for the opportunity to try and win those pretty pine cone zinnias! I love the wreath and will make one. I am subscripted to your blog,and very much liked your cooking video! I love the cast iron cookbook holder. Hope I win it! Yes I am a subscriber to your blog, and love it! Your pinecones are beautiful, and anyone would be blessed to receive them! Thanks for the opportunity to enter this giveaway! LOVE your creative use of pinecones!! Would love to win some to use on a wreath!! I’ve been following your blog for a long time. Love your blog and your pine cone flowers. Zinnias are one of my favorite flowers. Sure would love to win them. I’ve pinned your pinecone flowers with every intention of making some but what could be better than getting some from you! I follow you through feedly so I never miss a post. I would love to decorate with these for spring! They are so cute! I love those colors. I subscribed. Love the aqua, red and yellow combo! I’m a subscriber. Very clever – and they do look like zinnias!! – count me in! I adore these pinecone flowers! I am going to attempt to make some to put in a large glass vase I have. Winning pinecones would let me make a lot more flowers! Love your turquoise & red color combo! You have got to have the cutest cottage in the Carolinas….always up to something!! I love, love, love these flowers/pinecones. I am a newbie here and have subscribed to your site. You are very talented and would love to have you as a neighbor. Have a glorious day. Oh, the pine-cone flowers are gorgeous! I would love a set in blue shades! Thank you for participating in the link giveaway. Super pretty! The colors are spot on! You’re very talented Jane. You are a talented lady! Love your ideas! Zinnias are my favorite flower. Even have a zinnia tattoo. Plant them every year. I need some pine cones. They are beautiful. Super cute, pinecone lady! You could sell these I bet!! When we lived in NE Florida I realized they have the largest pinecones I’ve ever seen. I thought that was so odd!!! Those pinecones are so cute! Thanks for the great selection of ideas. Love those petite pine cone flowers! Thank you for all your great info! I love the pinecone flowers! So cute. I love zinnias! I wanted to subscribe to your blog but didn’t see a link anywhere. Hi, Jane – love your pinecones. Thinking to use them in holiday decor, too! Great creativity. Hey pinecone lady ??? ?, I love your colorful pinecones and how you create with them! I can think of worse things to be known for then the pinecone lady!!! What a neat idea—-and free if you have pine trees! Love these! What a clever way to decorate with pine cones! I grew up in and around them all my life living in Northern California. We did a lot of things with pine cones, but making flowers out of them is absolutely genius! I would love to win these and use them as a table decor for dinner or just on a coffee table as decoration. I can’t wait to see who wins! I love these pine cone flowers and would love to have some of my own. The colors are beautiful. Oh, my goodness! Yes, I would love the pinecones. I tried to do them but it was too hard for these old hands. I really like your wreath and the other things you have done with the cones. Thank you for giving us a chance to receive some. Blessings from S.C.
Wow these are so cute! They would look great in a bowl in my kitchen as I have the same color placemats on my grey painted table! Pick me pick me! Having moved from the south I miss pinecones. Yours are so pretty and fun. I’m already an email subscriber to your blog. Your posts are like a trip home. Love your ideas Jane! The pine cone flowers are adorable! LOVE your new format. Everything is so easy to find…….and no wretched pop-ups! Also love your pine cone flowers! !